Women and the Military Budget. As the Israeli settlements in Gaza were being evacuated, 700 women from 35 countries met at the Women in Black International Conference in Jerusalem, 12-16 August 2005. "... Although after the recent public release of the video of the torture and execution of a group of civilians in Srebrenica the share of the population that is ready for facing with the past has increased, Serbia is still far from the state of mind that will enable effective facing with the past and real catharsis. This means that there is still much work for changing the dominant climate in the country. Women in Black will mark the 10th anniversary of genocide in Srebrenica on July 10th in Belgrade with the protest action "Never Again", expressing solidarity with the victims, as well as protest against the politics of denial of the criminal past which is being carried out by the current government. Participation in this manifestation has been confirmed by Women in Black activists from Italy and Germany. Members of the Women in Black Network in Italy will, on that day, in cooperation with other peace and feminist group, organize protest vigils in over 10 towns. We are inviting members of the WiB International Network to join this action by organizing vigils in their own communities. Women in Black from Belgrade and other parts of Serbia will travel on July 11th to the central commemoration that will be held in Potocare, near Srebrenica, in order to pay respect to the victims of genocide as well as express solidarity with their families..."
We would like to inform you about the conference and street performance that WiB held on the occasion of two very important dates for the women's autonomous movement -- May 24th, International Day of Women's Action for Peace and Disarmament and May 28th, International Day of Action for Women's Health and Reproductive Rights. 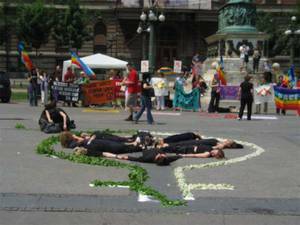 During the street performance and the process of creating the symbol of Women in Black by using salt, daisies, and green boughs, several activists laid on the ground and formed a circle in the center of the symbol. Another segment of our marking these dates in the framework of our conference "Everything for Peace, Health, and Education -- Nothing for Armaments" were interactive lectures and workshops where we discussed the issues of national, traditional and human security, with particular accent on feminist theories of security and UN Security Council Resolution 1325 (Women, Peace, Security). Another panel was dedicated to women's reproductive rights and the abuse of them by fundamentalist tendencies. Every year in Serbia, the Serbian Orthodox Church openly interferes in the state's work and exerts pressure on women's reproductive and sexual rights. According to our research, in relation to last year, women have a negative feeling towards abortion in the moral sense, however, the worrying fact is that a good part of women experience abortion as murder, and what is dangerous is that this attitude is more prominent among young women than those who have experienced abortion as a fundamental human right. This fact shows the dramatic consequences of the clericalization of the state and the strengthening of theocratic tendencies, which unfortuately is also a worldwide phenomenon.